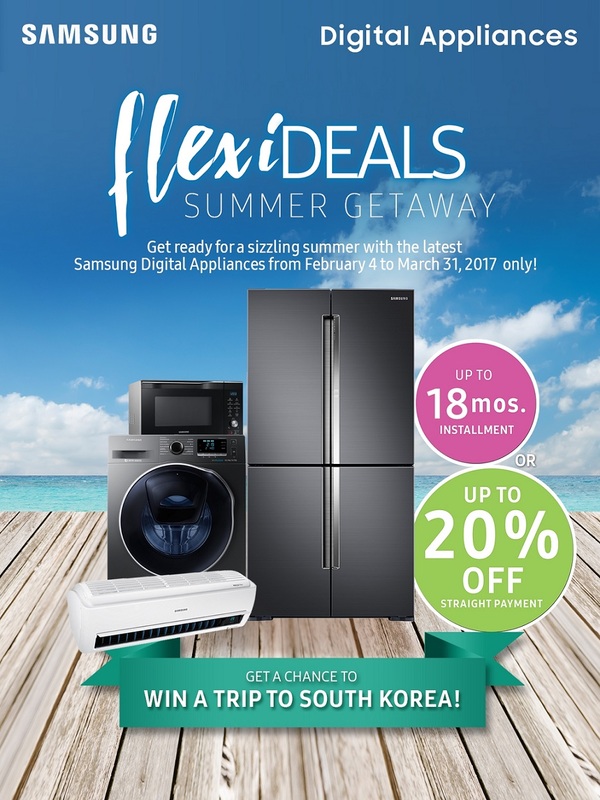 Home FlexiDeals Summer Getaway Promo samsung Hurry and avail of Samsung’s “FlexiDeals Summer Getaway” promo and get a change to win a trip to South Korea! Hurry and avail of Samsung’s “FlexiDeals Summer Getaway” promo and get a change to win a trip to South Korea! The summer season just got better with great deals from Samsung Digital Appliances. Don’t miss out on this chance to have both innovative products and well-deserved convenience when you purchase a Samsung refrigerator, air conditioner, washing machine, and microwave oven. With the FlexiDeals Summer Getaway Promo, customers may get as much as 20% off for straight payments and discounts on installment payment options for as long as 18 months. The surprises don’t stop there! Samsung is giving 3 customers a chance to win an all expense paid trip for two to South Korea, Singapore, or Boracay when they purchase any Samsung Digital Appliance until March 31, 2017 only. Customers have an entire month left to grab this exciting opportunity, so head now to the nearest Samsung authorized dealer. More details can be found by visiting the Samsung Facebook page or through samsung.com/ph/offer/flexideals2017.